Check here to see what new events we have listed. This is not an all-inclusive list. If you have info on events that are not on here or events that are out of date, please email the info to me. Click here if you feel this has helped you and would like to make a donation through PayPal. Any amount is welcomed. Thank you for visiting. Visit our THANK YOU page! Think you can spot a native signer when you see one? What about their signing gives them away? Participate in our project investigating native and non-native accent in ASL! The experiment lasts only an hour, and we will pay you $10 for your help! 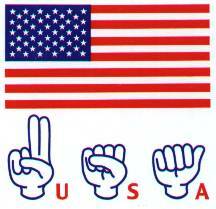 Beginning Signers (who have completed ASL 2, but have not completed ASL 3). Ever been mistaken for a native/Deaf signer? Ever been identified as HEARING in the first 5 seconds of conversation? Ever wonder why? Participate in our project investigating native and non-native accent in ASL!